Arnaldo Roche is one of the most important artists to emerge from the Caribbean since Wilfredo Lam came to prominence in the 1940’s. Like Lam, Roche explores issues of identity rooted in his mixed Spanish and Afro-Caribbean ancestry. Lam’s formal lineage can be traced to Cubism and Surrealism, while Roche is a born Expressionist, closer to Van Gogh than to Picasso. 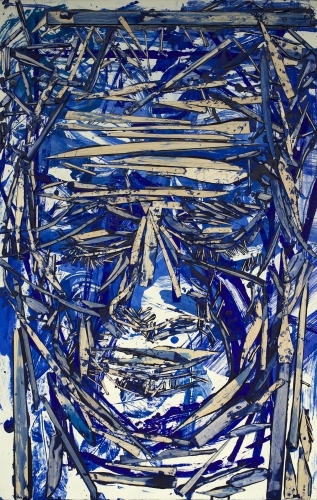 Roche is obsessed with memory, both its burial and retrieval, and this is echoed in his painterly technique; Roche often makes rubbings of his subjects’ bodies, while laying them (or wrapping them) directly behind the surface of his canvas. He may also print ferns, lace, and other poetically charged objects onto his painting’s surface. What follows is a complex process of covering up and scraping away pigment. Initial impressions are concealed, revealed, transformed, made at once distant and corporal realities. Although Roche’s work is always personal, there is a political subtext to much of his painting. His focus on the instability of self has a correlative in Roche’s identity as a Puerto Rican: at once colonial subject and citizen of the world’s most powerful country. Roche’s paintings do not offer facile political solutions to the complexities of colonial identity. From his dual vantage point, Roche asserts that to be a colonial is to be in perpetual doubt and, in this sense, his is a geo-political form of Post-Modernism.